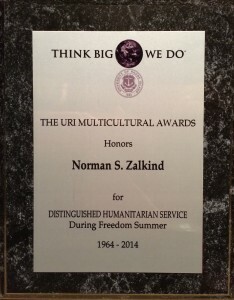 On September 29, 2014, ZDB founding partner Norman S. Zalkind attended a retrospective on the 50-year anniversary of the Freedom Summer Project at the Multicultural Center at the University of Rhode Island (“URI”). Norman began his career after law school doing civil rights work in Mississippi before returning to Boston, where he founded the law firm that is now ZDB with the goal of emulating the rigorous trial work he had experienced trying criminal cases in the South. At the retrospective Norman was interviewed as part of a project to create a videotaped record of memories and reflections about Freedom Summer to be housed in the archives of the Carothers Library at URI, and was among the veterans of Freedom Summer honored at an evening banquet.